This dessert is light, airy, with just the right amount of durian flavour. Generously butter the insides of the soufflé dishes and sprinkle with sugar, knocking out any excess. Chill. Beat egg yolks and 3 tablespoons of sugar together, then whisk in all the flour, making sure the mixture is well-incorporated. Pour the milk into a pot and bring to a boil over medium heat. As soon as it starts to boil, remove from heat and whisk half of the milk into the egg mixture. Once well-mixed, pour it back into the remaining milk. Bring back to the boil, whisking, and cook till it has a custard-like consistency. Remove from heat and pour into a mixing bowl. Stir in the durian. In a separate mixing bowl, whisk the egg whites till fluffy, then whisk in vinegar and 1 tablespoon of sugar slowly. Fold the egg whites into the durian custard. Spoon the mixture into the soufflé dishes. 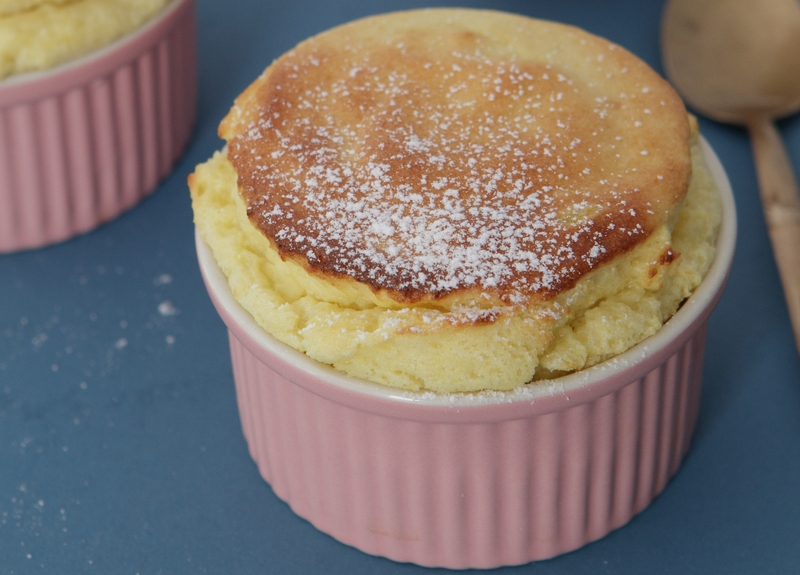 Run the end of your thumb around the top inside edge of each soufflé dish (this will help the soufflés rise evenly). Bake in the middle rack of the oven for about 15 minutes, or until golden brown and risen. Carefully remove from oven and serve immediately.